Food Wars Volume 9 is the ultimate foodgasm. We pick up at the Fall Classic finals and get treated to some very lunchy themes – bento boxes and hamburgers. Soma Yukihira and Alice Nakiri face off in the first quarterfinal round to produce the bento box that will win the judges favor. Alice dazzles them with a visually beautiful bento that seems destined to win. Soma, using his wacky creativity and inspiration from children’s candy, creates a meal that considers all of the elements of a packed lunch and turns Alice into a crying fool. Megumi faces off against a swashbuckler chef and causes the Headmaster to disrobe… in a very discrete manner. Akira Hayama and Hisako Arato face off in a battle to make the best burger, both of them picking very unorthodox ingredients that leave the judges and audience in suspense. In the meantime, Soma oversleeps and misses the early portions of Akira and Hisako cooking it up. On the way to the classic, he runs into a rather eccentric biker character who has done a massive amount of spying on the competition. This volume ends with Akira and Hisako plating and serving their meals. We’ll just have to wait until Volume 10 to find out who wins. This volume was very fast paced. 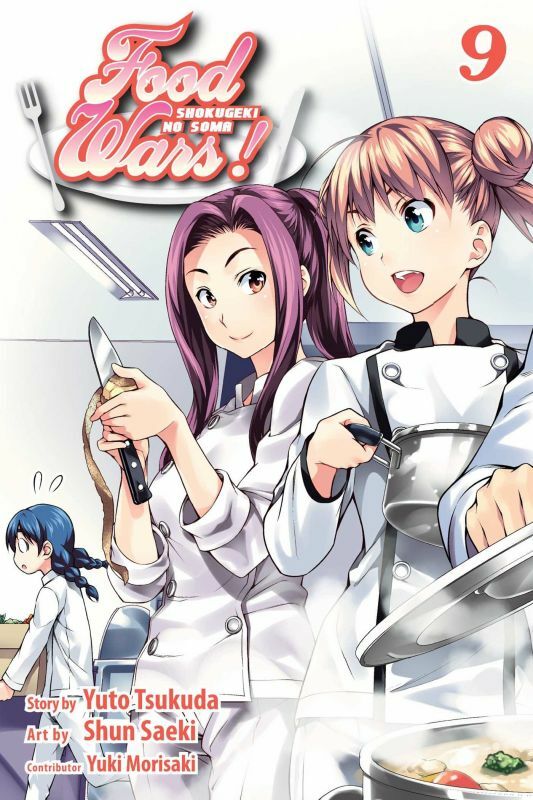 Normally not too much happens in each volume, but this time we witness three cooking battles, meet some new characters, and encounter some interesting hints at plot twists. Soma’s bento is simply salivating and worth trying to cook at home. The burger battle is equally as enticing although I’m not too sure I’ll be trying that idea any time soon. Finally, what I love most about this series are the facts thrown in about cooking. In this volume you learn a bit about gelatin and how it interacts with the mouth’s soft palate. Soma’s idea for nori is actually very easy to do at home (I have a cookbook explaining the process and yes, the ingredients are readily available in reality as they are in this manga). If you’re a foodie, this volume is going to delight you and give you some new ideas for kitchen experiments.